Big league hardware stuffed inside a console sized chassis. 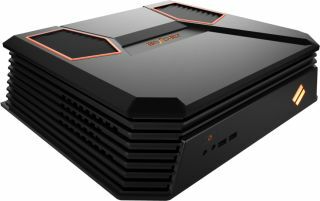 Syber Gaming, a division of CyberPower PC, impressed us last year with its Vapor system, which was basically a Steam Machine turned into a Windows box (due to Valve dragging its feet). There's been quite a bit of movement in the hardware industry since the Vapor debuted, so now Syber is pitching its new C series of small form factor systems powered by Intel Skylake processor options and Nvidia Pascal-based or AMD Polaris-based graphics solutions. You're not limited to the above specific configurations, as you can customize any of the setups with a wide range of component options. There are also specials to be aware of—one that's not selected by default is a free 256GB Intel 600P M.2 NVMe SSD when paired with a mechanical HDD. You could actually save money and gain faster storage in some cases. For example, on the Syber C Xtreme 400, you can knock $107 off the price by opting for a 5TB HDD paired with a free 256GB Intel 600P. Or save more by going with a smaller HDD. Syber's pushing VR and 4K gaming in a relatively small box with the C series. The hardware you choose will dictate what kind of VR or 4K gaming experience is possible, but as far as connectivity goes, each C series is compatible with the HTC Vive and Oculus Rift. Each one features multiple USB 3.0 ports and other goodies, depending on the specific motherboard. The C series is available to configure and purchase now.